So far most of Antarctica has not been greatly affected by climate change, at least as far as researchers can tell. However there is one place in Antarctica that has witnessed some of the most drastic changes on the planet: the Antarctic Peninsula. Here temperatures have been rising, sea ice has been retreating, ice shelves have been breaking up, and ecosystems have been heavily impacted. Researchers working within the framework of the Long-Term Ecological Research (LTER) Network at the American Palmer Station have been studying the marine ecosystems along the western coast of the Antarctic Peninsula for several decades now. Funded by the National Science Foundation (NSF) and part of the US Antarctic Program, the Palmer LTER project has documented some significant warming-related effects on many species, particularly on penguins, krill and phytoplankton. In the following interview, Dr Hugh Ducklow of the Marine Biological Laboratory in Woods Hole, Massachusetts, tells SciencePoles about the marine research projects being carried out at the US Palmer Station within the framework of the LTER Network and some of their findings, many of which are not favourable for the long-term outlook of marine ecosystems along the Antarctic Peninsula. How long has research under the LTER Network at Palmer Station been going on? The specific program we're involved with, which is the Palmer LTER Project, started in1990, although there has been related research going on in the same location since 1975 more or less, and some of the people and some of the work already being conducted there was incorporated into the LTER when it was formed. I only joined the program more recently in 2001. But it has been going on with continuity since the 90s explicitly and since the 70s generally. According to the LTER website you're looking at how sea ice and atmospheric conditions are affecting ecosystems on the west side of the Antarctic Peninsula. Has the research program evolved over time? When the program was originally conceived, it was about marine ecosystems, with a focus on sea ice, its annual extent, the rhythm of advance and retreat and how this advance and retreat influenced the ecosystem. But as time went on, the program recognized that significant climate warming is happening along the peninsula, and this has become the most important aspect of our research: documenting changes taking place and then trying to understand how the mechanisms governing how marine ecosystems are responding to climate warming in that region, and sea ice plays a major role, of course. One of the main things that has been happening is that sea ice coverage has been declining quite significantly in that region, and so it affects the whole ecosystem. The website also mentions that there has been a shift in ecosystems and a shift in the distribution areas of certain species you're studying. The shift in the Adélie penguin populations is the most obvious thing we've noticed. Adélie penguins are gong extinct locally, although not extinct overall. There are still Adélie penguins further south. But in the particular region we're studying in the central and northern Antarctic Peninsula their numbers are declining - by about 80% since 1975. And at the same time there are two related species, the Gentoo and the chinstrap penguins, which are rapidly immigrating and colonizing that area and establishing nests in the areas abandoned by the Adélie penguins. Another thing is that only over the past couple of years have we finally collected enough data to establish that there are significant changes also occurring at the base of the food chain. For example, phytoplankton populations all along the peninsula have changed since the 1970s in response to warming and sea ice decline. And other observations besides ours - in particular those of the British Antarctic Survey - have established that krill have been declining over a much larger area extending up north to the Falkland Islands and the Scotia Sea. So the krill seem to be declining as well and that's related to sea ice decline. The sea ice supports a community of phytoplankton - sea ice diatoms that flourish in the ice in the austral spring - which supplies a food source for juvenile krill. The spaces underneath the sea ice also serve the juvenile krill as a place for them to avoid predators, since they have more difficulty avoiding them. So as the sea ice declines, krill are losing both their habitat and their food source. How closely do you cooperate with other research projects along the Antarctic Peninsula? 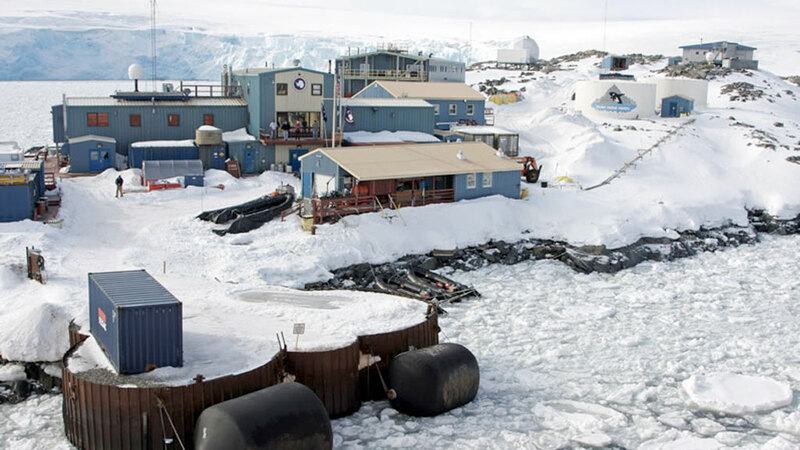 We cooperate quite closely with the British Antarctic Survey, and they have a complimentary program to ours down at Rothera Base on Adelaide Island, about 400 km to the south of Palmer Station. We actually visit them every year during our annual survey cruise, and they have a program that takes some of the same kinds of measurements that we do and some of the scientists working there are co-investigators in some of our projects. We're aware of other work being done by some of the stations further north on the peninsula, and there are some other US programs looking at penguins and seals, which are part of the CCAMLR program. So they have researchers that deploy into the field every year on the US icebreakers. Are you having a look at the data all the groups up and down the peninsula are gathering and taking a global look at it? We're trying to. We're working more closely with the British than the others, and with some of the other projects on the peninsula we're trying to get a more synthetic look at the three penguins species by getting together with these other investigators and looking at all the data throughout the peninsula region. So you're mainly looking at phytoplankton, zooplankton, diatoms, krill, and various penguin species? These are the groups of organisms for which a certain amount of change has been established. But we also have other aspects to the Palmer LTER program. There's a physical oceanography component looking at currents and water mass distribution and at processes that are transporting heat from the offshore Southern Ocean up onto the shelf along the peninsula. That's really the main physical process that's causing the warming and the sea ice decline. The air is warming around the peninsula, too, but the ocean has a lot more heat than the air. However the atmospheric warming alone isn't enough to account for the sea ice decline and the decline in glaciers. What's melting them is the massive amounts of heat being transported by upwelling under the shelf from the Antarctic Circumpolar Current (ACC). We put a large amount of effort into studying these physical oceanography and circulation processes. With that and the studies of the ice from remote sensing, this forms the foundation of the program that allows us to do all the ecological work. Besides the rise in ocean temperature, have you been noticing any changes in ocean currents? There haven't been high-resolution observations until recently, so we can't really say the frequency of upwelling events has increased because we don't have a background to establish that. But we do know from oceanographic measurements of temperature going all the way back to the beginning of the 20th century that there has been a significant rise in the amount of heat on the continental shelf over the past five or six decades. So while we don't have direct observations of the actual transport mechanisms, we know that the heat content has increased. Has the heat increase along the continental shelf been noticed elsewhere in Antarctica or just around the Antarctic Peninsula? Only along the peninsula. The reason the Antarctic Peninsula is special is that it's the one place where the Antarctic Circumpolar Current really rushes right against the continental shelf break area. If you go around the rest of the continent to the Weddell Sea, the Ross Sea and so on, the coastal circulation keeps the ACC out away from the continental shelves for the most part. So the peninsula is the one place where the immediate coastal region of Antarctic really interacts with the open sea. And that's why the peninsula is warming up and the rest of the continent is not warming up as much. Most of the sea ice decline has been established right around the western peninsula there where the current comes in. How much has the average oceanic and atmospheric temperature increased since observations began? The big statistic is the mean winter temperature - the average winter temperature over June, July and August - which has increased by 6°C since 1950. That's a huge change - it's about five times the average rise in global temperature since then. Winter in particular in this region is getting very much warmer, and if it continues at the same rate as it has over the past five or six decades, within 30 or 40 years the mean winter temperature will be above the freezing point of seawater, which means on average there won't be any more sea ice formation. And because the whole ecosystem depends so much on the extent and seasonality of sea ice, there will be widespread fundamental changes in the structure of the marine ecosystem. Has any research been done a Palmer Station on how terrestrial ecosystems are being affected? In the US program there have been some projects here and there. Some people in our project have done a few individual, short-term three- or four-year studies looking at some aspects of the vegetation. But no global studies have been done so far. We have noticed, however, that throughout the northern and central peninsula there's been a lot of glacier retreat, and as glaciers retreat plants colonize the newly uncovered soil. From Palmer Station we've been able to see the native Antarctic plants (Antarctic hair grass, Deschampsia antarctica, and a cushion-forming pearlwort, Colobanthus quitensis) increase and expand. Lots of different mosses are also forming thick beds in areas where glaciers have retreated decades ago. It's quite interesting because you can see the biosphere changing. Every year you notice something has changed. Have you collaborated with researchers working under the Latitudinal Gradient Project (LGP) at all? There are two places in Antarctica where the coastline runs more or less from north to south: on the Antarctic Peninsula and on the Victoria Land Coast of the Ross Sea. The LGP is a loose international consortium of research projects working along the Victoria Land Coast looking at ecosystems along a north-south latitudinal gradient. In Victoria Land they're looking at how the latitudinal gradient affects ecological zonation. Of course in that region there hasn't been any significant long-term warming, at least not yet. But there has been some talk about trying to coordinate and compare the two north-south transects along the peninsula and the Victoria Land Coast. There's an LTER research project in the McMurdo Dry Valleys that's part of the LGP, which has a different scientific focus from ours. They work mostly on terrestrial ecosystems, glaciology and lakes and streams. They don't have a marine component and we don't have a land component. But we interact with them quite closely and the two together are complimentary. On the Palmer LTER website you mention you're studying pelagic marine ecosystems. Has there been any attempt to look at benthic marine ecosystems? Not in our project. There are some other US researchers doing that. One thing about the continental shelf in the Antarctic region is that the shelves are typically 300 metres deep or even deeper, so there's much less contact between the upper ocean and the sediment ecosystem. It's the continental shelves off of Europe and northeastern North America where you really need to look at both pelagic and benthic ecosystems together. The mass of the ice sheet really weighs down the continent and depresses the shelves. Hugh Ducklow is Co-Director of the Marine Miological Laboratory's Ecosystems Center in Woods Hole, Massachusetts. A biological oceanographer, Dr. Ducklow has been studying the dynamics of plankton foodwebs in estuaries, the coastal ocean and the open sea since 1980, with a focus on microbial foodwebs and the role of heterotrophic bacteria in the marine carbon cycle. He has participated in oceanographic cruises in Chesapeake Bay, the western North Atlantic Ocean, the Bermuda and Hawaii Time Series stations, the Black Sea, the Arabian Sea, the Ross Sea, the Southern Ocean, the Equatorial Pacific and the Great Barrier Reef. He currently leads the Palmer Antarctica Long Term Ecological Research Project on the west Antarctic Peninsula, investigating the responses of the marine ecosystem to rapid climate warming.